Historically, Germany has not got a great international reputation for hospitality. But one year ago, in summer 2015, at the peak of the European refugee crisis the world suddenly looked at the Germany differently. Ten thousand refugees from the Middle East and South-Eastern Europe arrived there each day, welcomed by applauding crowds at the train stations. Germany was seen as open-minded, welcoming and humanitarian, perhaps for the first time recent times. The mainstream media celebrated this new, humane side of the German public and government. Angela Merkel’s quote “We’ll make it” became a mantra for volunteers and the entire population. The media covered plenty of the touching stories of Syrian families surviving weeks of life-threatening journeys over the Mediterranean. Experts praised the wave of young, educated refugees as the solution to overcome the demographic problem in the future. The largest news platform and tabloid BILD launched the campaign ‘refugees welcome’ supported by high-level politicians, sportspeople, artists and celebrities. Suddenly, there was a reason to be proud of being German, in a country where national pride is scorned and nearly non-existent. Now, one year later, the perception has changed. Mainly driven by the mainstream media, it’s not longer ‘refugees welcome’, it’s more ‘how on earth should we deal with this situation? !’ The major media outlets have shifted their positions, but not entirely how we would expect. Even after several terror attacks planned and committed by Syrian refugees, the German media doesn’t denounce refugees directly. Instead, the government is criticised for insufficient integration programmes, unsatisfactory security checks and a lack of resources for the communities involved. In a country where press, television and radio has been abused in the most terrible and inhumane way, media values are different to other Western countries. Instead of criticizing a specific ethnic or social group, the German media tries to be politically (über-) correct, compared to other, rather outspoken media outlets in the Europe. Restrained media coverage is first of all a good idea. Brash, aggressive, anti-immigrant headlines may help selling newspapers, but they also fuel racist views. Nevertheless, it becomes a problem when a large part of a population can’t find its fears and concerns in the mainstream media anymore. This is dangerous as well. Since last summer, the media coverage was almost completely positive and critics were only rarely mentioned in the mass media, the German press and broadcaster have lost their credibility. 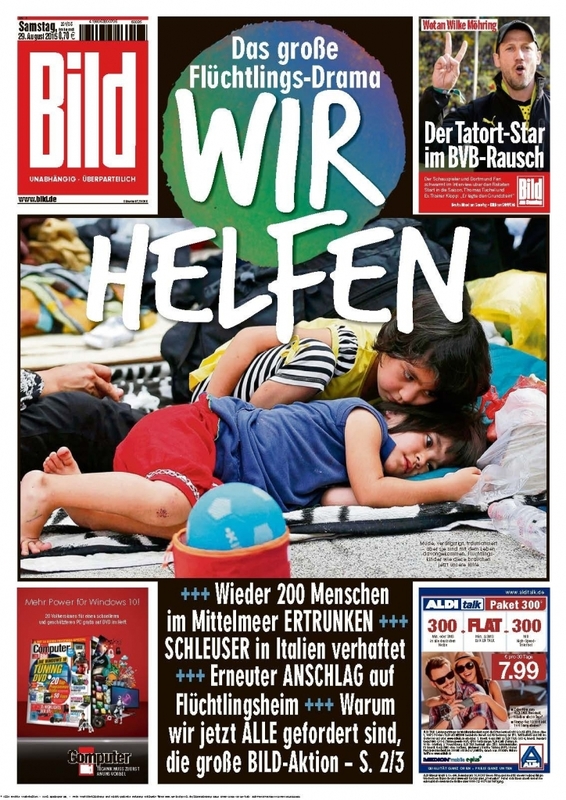 According to the left-liberal weekly newspaper DIE ZEIT 50 per cent of the German population don’t trust the media coverage on the refugee crisis. The right-wing party AfD (Alternative for Germany) used the unbalanced news coverage for their purposes. The party mobilized thousand of conservative people, who felt left behind and not heard by the government or media. The term ‘Lügenpresse’ (‘lying press’) was re-used and manipulated to question the given information through the media and also to create mistrust in the political structures of the existing system. It’s ironic that the political über-correctness can actually cause the opposite. If half of the population doesn’t trust the mainstream media anymore, because it feels patronised and insufficiently informed, the individual finds other ways online to prove and – in the worst case – radicalize the own ideas. A democracy must allow and tolerate different opinions, in order to avoid extremism. That doesn’t mean agitation and defamation should be allowed in the mass media, but a broad range of political views including system and government critique should be covered and ‘whitewashing’ avoided.